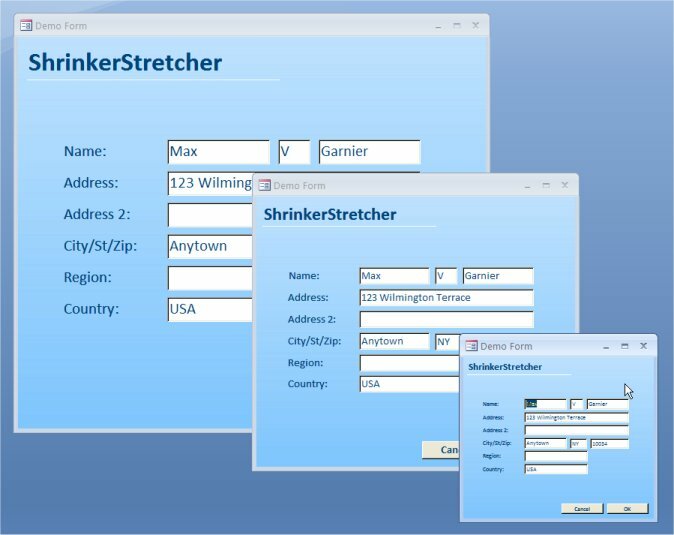 ShrinkerStretcher is a module for Microsoft® Access® that allows you to scale your forms, fonts and controls to fit any form window size or screen resolution. Now there's no longer a need to have different versions of the same form for each monitor display setting. Just use ShrinkerStretcher to scale one form to fit all screen sizes. Now supports Access 2013 32 and 64-bit! ShrinkerStretcher consists entirely of VBA code so it is easy to distribute with your Access application. Download ss.zip - trial version for Access 2013, 2010, 2007, 2003, 2002, and 2000 (2,470kb). v11.8 - 3/20/2014 - Fix to Access 2013 32-bit trial version installation. v11.8 - 10/11/2013 - Access 2013 trial version included. v11.8 - Misc bug fixes. v11.7 - 11/9/2012 - Access 2010 64-bit trial version included in download. v11.7 - Access 2010 Navigation Control support, bug fixes. v11.6 - Fixes another bug related to Access 2010 64-bit compatibility. v11.5 - Fixes a bug related to Access 2010 64-bit compatibility. v11.4 - Access 2010 64-bit compatibility. Fixes a bug that caused distortions on Access 2010 forms with control anchors. v11.2 - Fixes a bug that caused an error 438 in ResizeOneControl routine having to do with controls that don't have anchors. Also some error handling enhancements included. v11.1 - Fixes a bug where a mis-handled error leaves some controls unscaled in certain situations on forms containing subforms. v11.0 - Includes Access 2010 support, optional centering of controls on form, performance improvements, scaling of control border widths, scalable checkbox and option button examples included, quiet mode option, reduced flickering, bug fixes. v10.1 - Resolves "Error (281) in SS_ResizeControls 2145" which occured for some users with non-US regional settings. v10.0 - Supports Access 2007, Vista compatible help file, bug fixes. Download ss97demo.zip - v9.1 trial version for Access 97 (414kb). Double-click on the downloaded zip file to open it, then double-click on the .exe file inside and follow the instructions on the screen to install this application on your computer. ShrinkerStretcher is licensed on a per-installation basis. Each installation of ShrinkerStretcher or an application that uses ShrinkerStretcher requires a license. Please see the license.txt file that comes with the trial and registered versions for more information. 10/11/13 - The trial download now includes demo files for Access 2013 32 and 64-bit. 3/5/13 - Version 11.8 released. 6/9/11 - Version 11.7 released. 12/13/10 - Fix version 11.6 released. 12/10/10 - Fix version 11.5 released. 11/4/10 - Version 11.4 released. Includes support for Access 2010 64-bit, bug fixes. 1/4/10 - Fix version 11.3 released. 12/10/09 - Fix version 11.2 released. 12/1/09 - Version 11.0 is now available. Features Access 2010 support and optional centering of controls on maximized forms. "I just purchased you Shrinker Stretcher, and it's fantastic." "Thank you for such a great product!!!" "My congratulations on an excellent program. Up until I purchased it about a year ago, I had been using a much inferior product obtained from another source."